Hey hey! 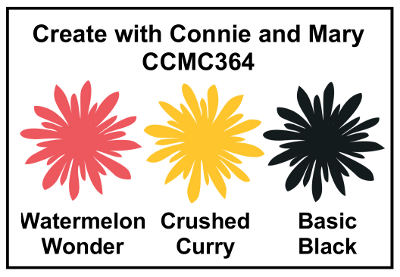 It’s color challenge time at Create with Connie and Mary! This week it was a challenge indeed! I struggled because these colors scream BOY to me and I was stumped! So, truth be told… I have never made a boy card. Ever. I have two girls and we are all flowers and rainbows over here! So I went out of my comfort zone and did things a little different. No flowers. No bling. 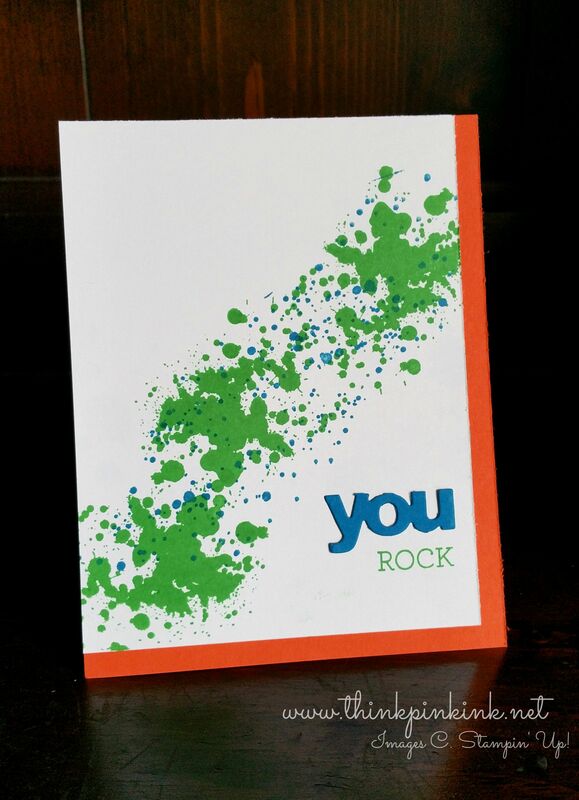 I used the Mini Treat Bag Thinlits for my “you” and the “rock” is from the Crazy About You stamp set. Of course the star here is the Gorgeous Grunge. And that’s it. Easy doesn’t even cut it! But it’s bright and boy-ie and my mind can rest from scrambling on what to do with the color combo! 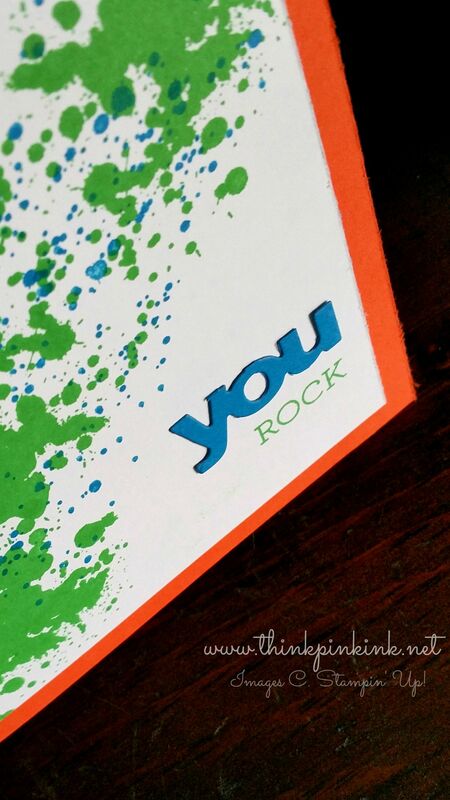 Unfortunately my blade is dull on my Paper Trimmer but I like the way that it roughed up the edge of the card stock! Ha! Now I don’t feel so bad about forgetting to put blades on my last order! 🙂 Thanks for stopping by! 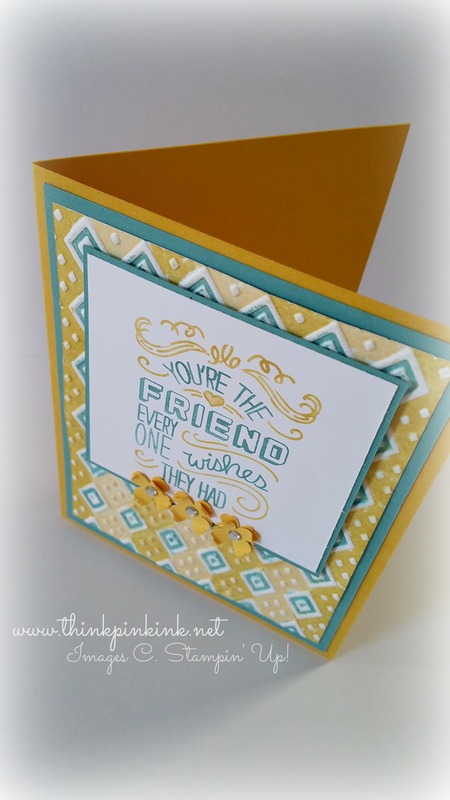 If you’d like to see some other great cards using this color combo pop on over to Create with Connie and Mary and if you’re up for the challenge, join in! Tagged Bridgette Jones, Crazy About You stamp set, Gorgeous Grunge, Mini Treat Bag Thinlit Dies, Stampin' Up! I loved this color combo! I think I’d even wear it! 🙂 I decided to also play along at CAS(E) this sketch. 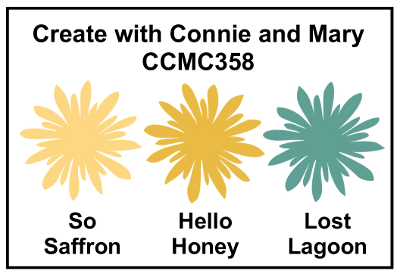 If you’re looking for some inspiration check out the other designer’s cards and play along at Create with Connie and Mary! I’ve been placed in a time warp and it is Thursday already! Where is the summer going?! Just can’t believe how time is slipping by… But alas, enough whining. 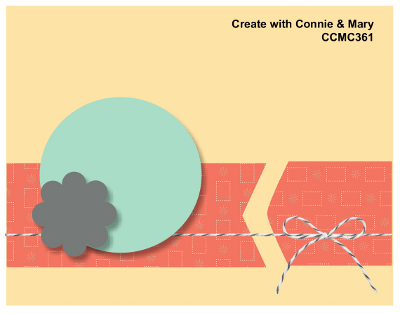 It’s time to discuss this week’s sketch challenge at Create with Connie and Mary! This was a fun one for me. I haven’t used my oval framelits in awhile so it was fun to get them out and play a bit. I used Coral Calypso and Basic Black for my go to colors. My flower is Hello Honey which I thought added just the right amount of contrast. I left everything pretty simple because my background DSP is so busy. Working with these colors had me thinking of Halloween! It will be here before you know it! Especially since I’m in this time warp continuum where my time is going just shy of the speed of light! 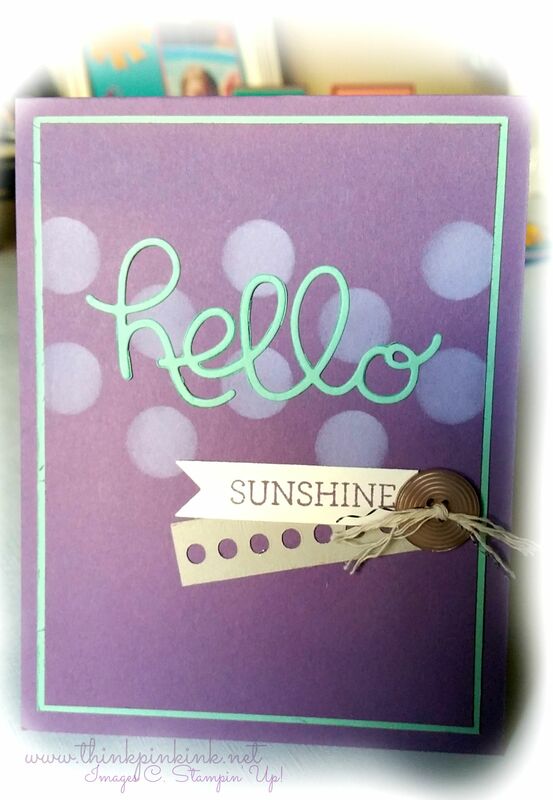 Tagged Basic Rhinestones, Bridgette Jones, Itty Bitty Accents Punch Pack, Lovely Lace Textured Impressions Embossing Folder, Ovals Collection Framelit, Perfect Pennents, Pretty Petals Designer Series Paper Stack, Stampin' Up! The Race is On and Here Comes Pride in the Backstretch! Could it be THURSDAY already?! T’is boys and girls and that only means one thing! 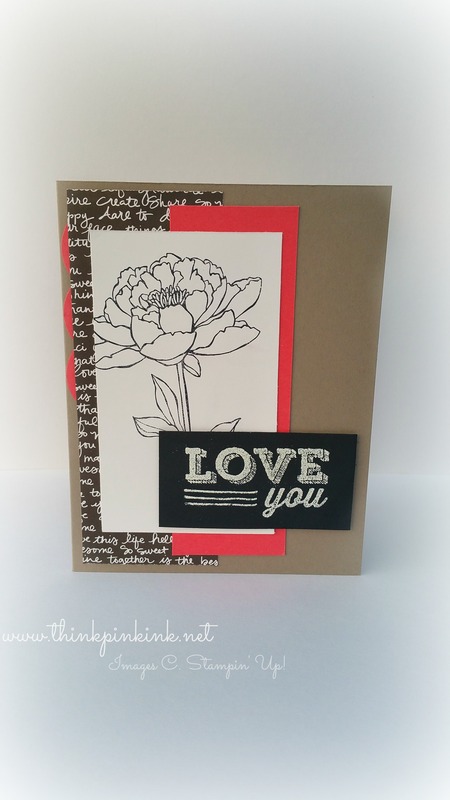 Sketch challenge time over at Create with Connie and Mary! I started out super confident about this sketch but don’t let it fool you folks! It’s called a challenge for a reason after all. I fought with this pup for HOURS! If you look closely you may see a little white playing peek-a-boo behind the Daffodil Delight hearts. That was part of the struggle. I felt desperate to use white for some reason and guess what… They were stitched on so I couldn’t remove them and pride wouldn’t let me start all over! I mean that was SILK thread I sewed them on with! haha! So I improvised and do what good folks do… COVERED THEM UP! 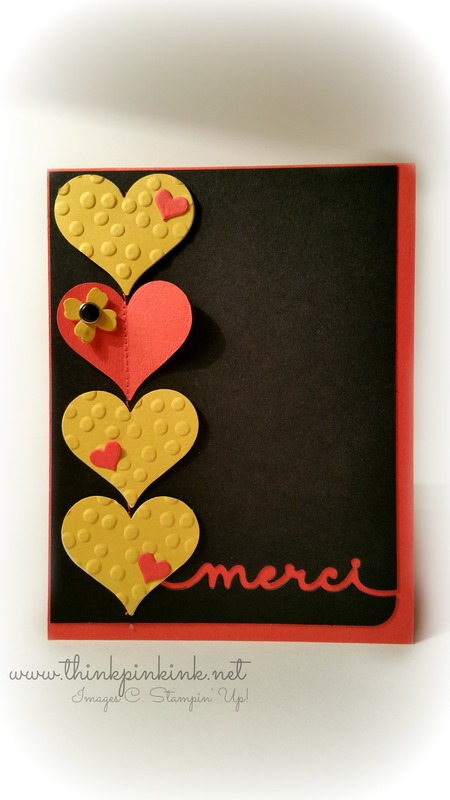 I ran some more hearts through the big shot using the Decorative Dots folder and voila! 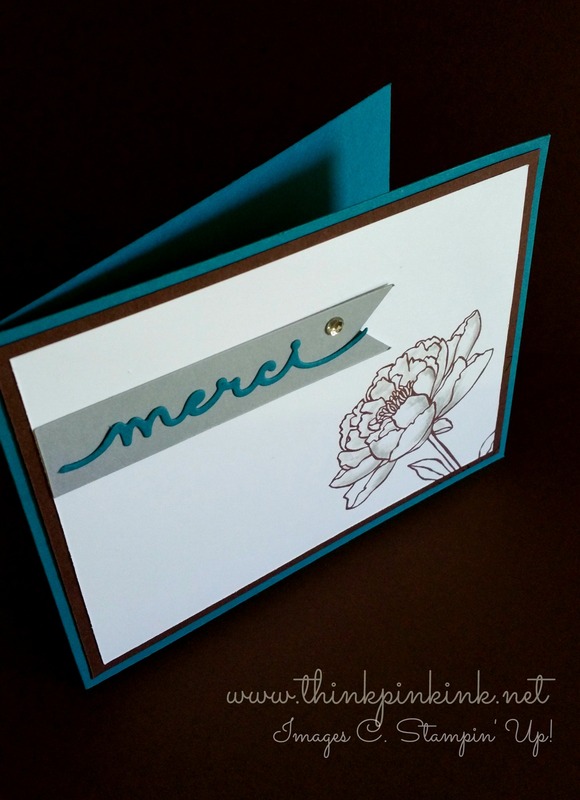 My “merci” is the negative cut into the Basic Black using the Greetings Thinlits (and just FYI Margaret Raburn, you can join me in France any time for some coffee at a trendy cafe! 😉 ). So that’s all folks! 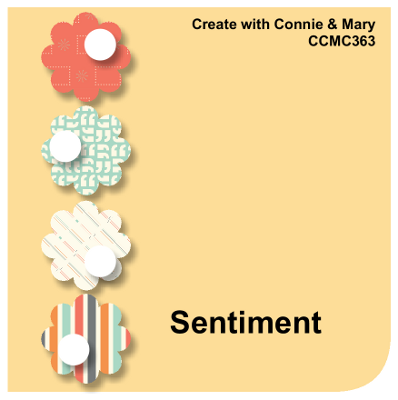 I hope you’ll click on over to Create with Connie and Mary and get inspired by the other designer’s cards. They always inspire me! Just one more thing… I know, last week’s post was short and this is draaaaaaging… (maybe because the baby is asleep!). But while typing and ending the sentence with a period, do you single or double space? There seems to be much debate over this. According to online references I am considered old school because I double space. Over and out for now friends! Thanks for stopping by! 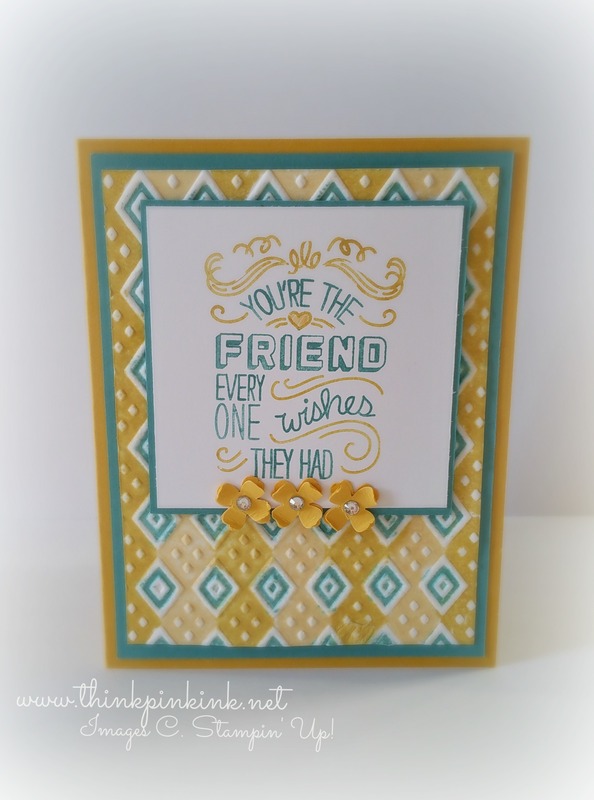 I used my new favorite stamp set, Friendly Wishes, for the sentiment. I folded the Dotted Lace Trim in half and tied it in a knot. 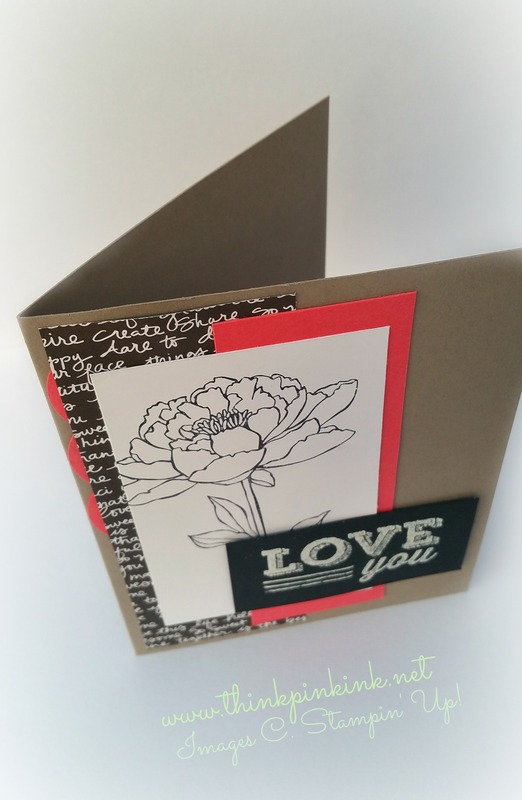 I stamped using the Flower Shop and Beautiful Bunch sets onto Lost Lagoon card stock with Craft Stampin’ Ink and used the coordinating punches. Was that a run on sentence? As I type my toddler is having a fit and I can’t hear myself think! Ha! This post has to be short for the sake of sanity!! 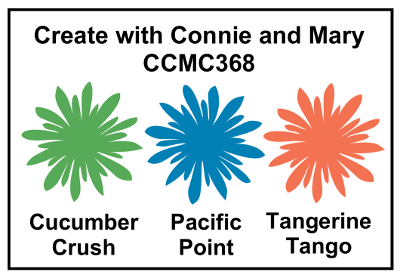 Come play along and get more inspiration at Create with Connie and Mary! Tagged Antique Brads, Beautiful Bunch, Bridgette Jones, Dotted Lace Trim, FLower Shop, Friendly Wishes, Fun Flower Punch, Pansy Punch, Stampin' Up! Ahhh yes, it’s that time again. Sketch challenge at Create with Connie and Mary! 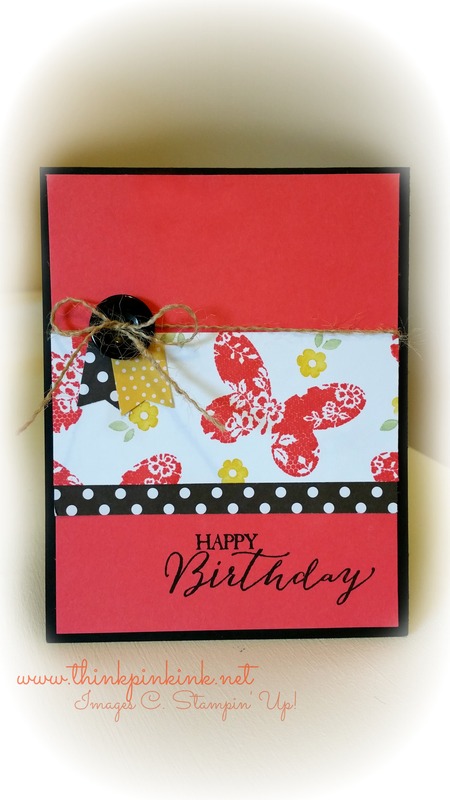 I got some goodies in that I just had to use for this card! I knew as soon as I saw the sketch that I wanted to use the Expressions Natural Elements. I also used the new Cherry on Top DSP stack! Love how this is 6×6 too. 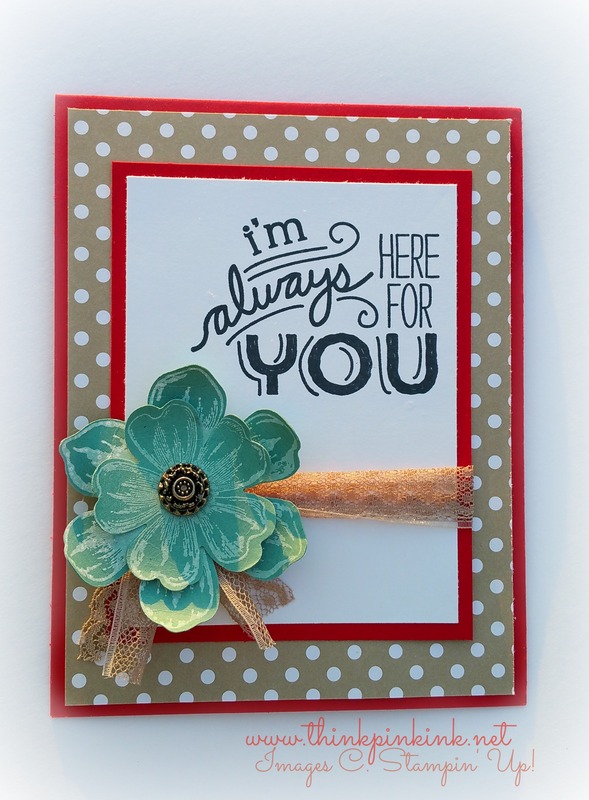 I used the Petite Petals and the flower from Itty Bitty Accents Punch to make my little flower. My color combo is the new Tip Top Taupe, Watermelon Wonder and Whisper White. 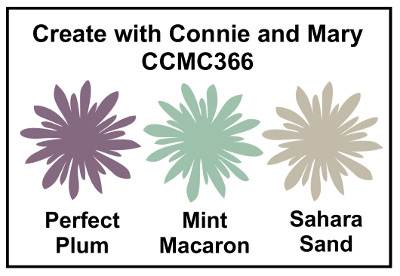 It’s color challenge time at Create with Connie and Mary this week. I started out attempting to do a sketch at another site with these colors but the sketch just didn’t work for me. It was too busy and I kept getting frustrated so I gave up and ended up with this number. Simple and clean for me this week! I lightly used my blender pen that was dabbed into Smokey Slate Ink to shade in the flower from the “You’ve Got This” stamp set. And naturally I added just a little bling with a Basic Rhinestone. 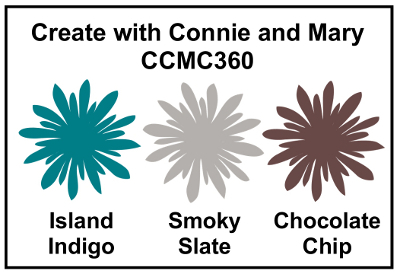 So I hope you all get your creative cap on and join us at Create with Connie and Mary. 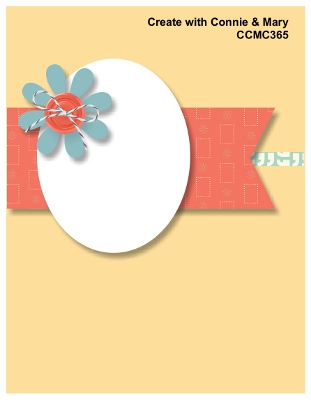 You can also check out the other designer’s cards, which are FABULOUS by the way, here! Guess what time it is… Go on friends “you’ve got this”… YEAH! Sketch challenge time at Create with Connie and Mary! My first take had the flower from the “You’ve Got This” set colored in with the coordinating Watermelon Wonder but it just wasn’t working for me. It looked like a card from the 80’s. 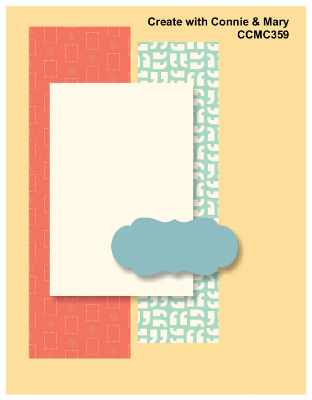 Just too pastel-ie and weird so I tried it with just black and I liked it! I even liked that it was off center. Maybe because I’m a bit wonky myself? Nah! hahah! I punched out some circles and placed them under the DSP to balance out the color. 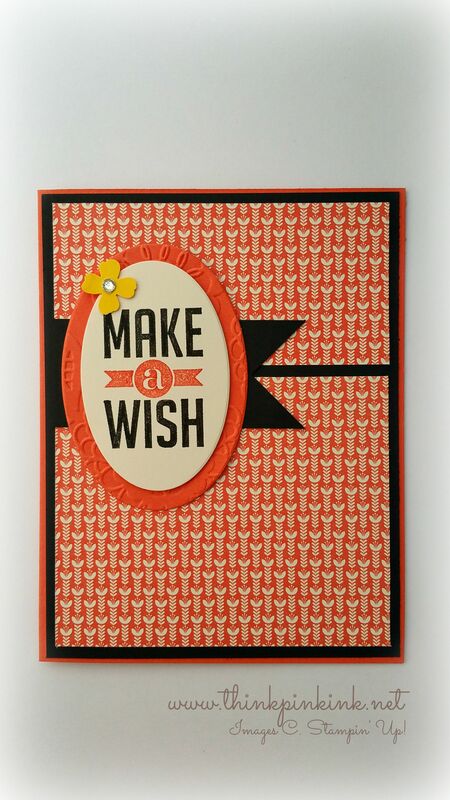 I also used the Friendly Wishes set for my sentiment. Love that too! 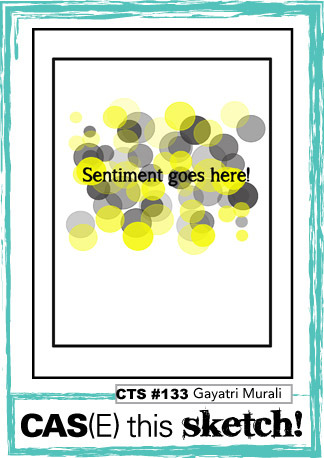 Anywho, I hope you get a chance to play along this week and check out the other designer’s cards here! 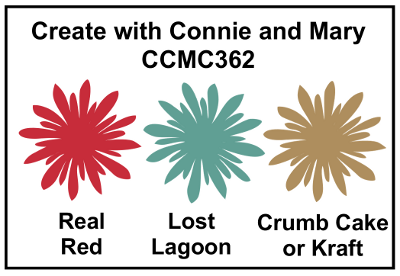 It’s color challenge time at Create with Connie and Mary! Above is this week’s trio. The color challenge was just that for me this week, a CHALLENGE! It’s kind of hard with the new catalog switch over because I don’t have any of the coordinating goodies yet! 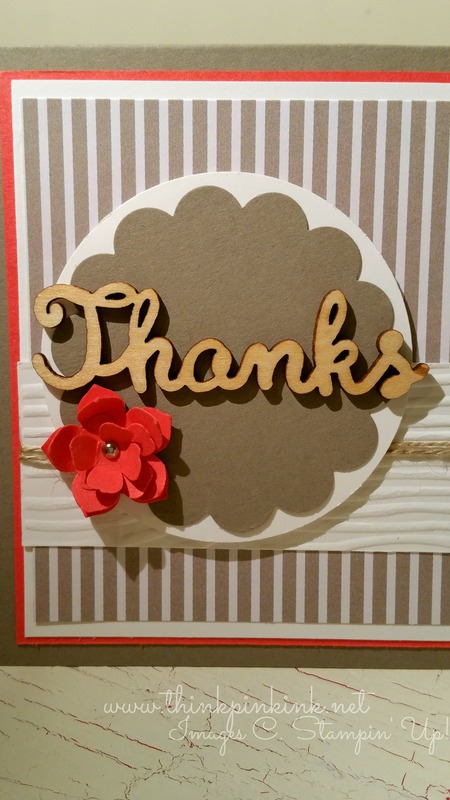 But I did have the new Boho Chic embossing folder so I used my Stampin’ Write Markers and colored it up. I used the Watercolor Paper and gave it a spritz of alcohol. My layout was from Freshly Made Sketches but I goofed and didn’t get it entered. 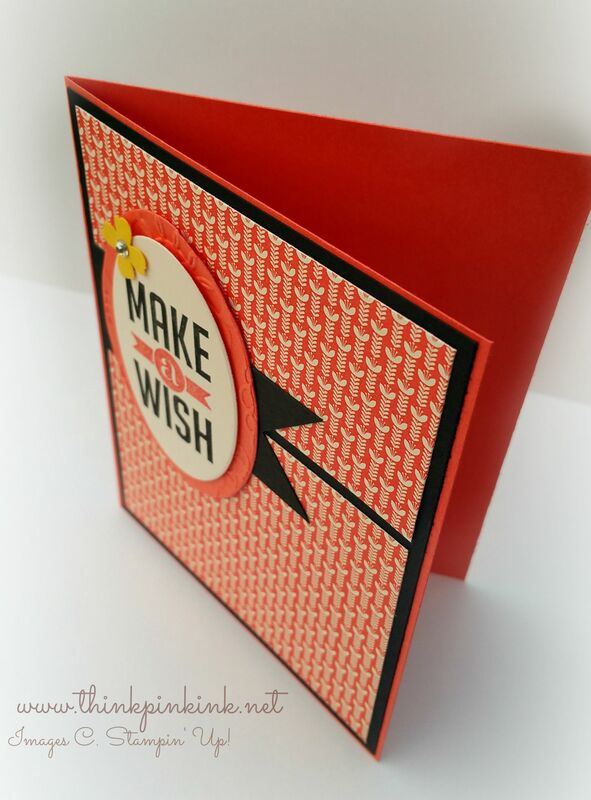 I used the new Friendly Wishes stamp set. Isn’t it sweet?!?! I think it is going to be one of my new favorites! Thanks for stopping by. Come and play along this week here! 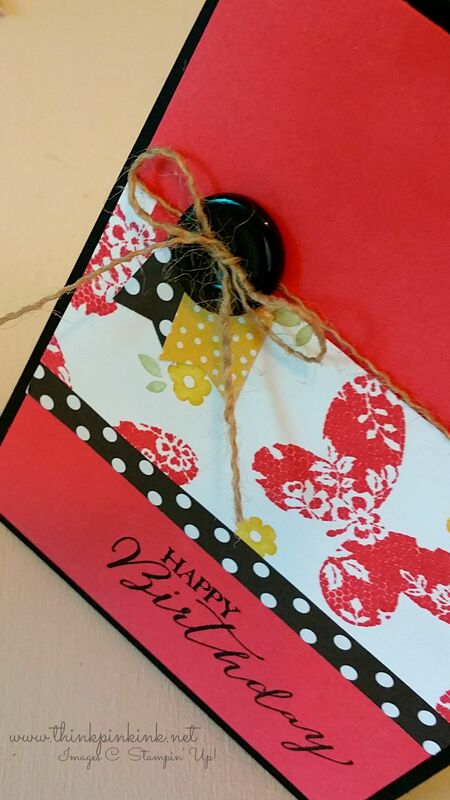 Tagged Basic Rhinestones, Boho Chic Embossing Folder, Friendly Wishes, Itty Bitty Accents Punch Pack, Stampin' Up!